If Ken Comée’s mother had her way, he would not be running a software company. The former CEO of reviews software company PowerReviews and Cast Iron Systems, which IBM acquired in 2010, comes from a family of health care professionals. That’s what he was supposed to become, too. That is, until his coursework stumped him and business school began to look appealing. Nowadays, Comée isn’t too far from his scrubs-and-stethoscope roots. 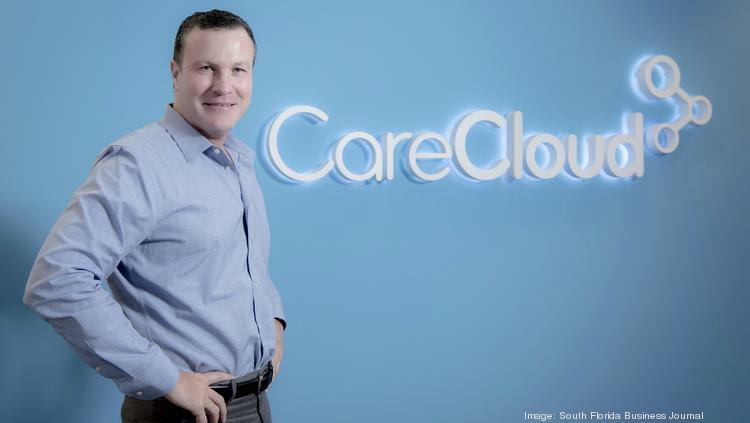 He is CEO of CareCloud, a cloud-based electronic health records company. He joined the company just over a year ago, taking over friend Albert Santalo’s position and transitioning from the West Coast to the East Coast. Though he spends a lot of time flying back and forth, the executive says South Florida — with its robust medical sector and vibrant dining scene — suits him well. What was your first job, and what was your dream job? Post-college, my first job was as a phlebotomist. I grew up in a family of medical professionals, and it was one of those environments where you could be anything you wanted as long as you became a doctor — or a lawyer or engineer. But then organic chemistry happened, and off to business school I ran. What’s the best piece of advice you’ve ever received, and who was it from? I had a lot of early mentors. Growing up, I played sports, and that was where I was told: “No matter how hard you fall, what’s important is how fast you get back up.” My high school baseball coach said that to me. Which historical figure do you most admire? Abraham Lincoln, for the courage he had and the decisions he made, which were, and continue to be, monumental. Which words or phrases do you most wish would become extinct? Any acronym. Anything to do with an acronym. The English language is becoming a world of acronyms. It’s difficult to speak anymore without hearing an impossible acronym be invoked. It’s a shortcut for language, and I happen to have a tendency to appreciate language. What are the positives and negatives of doing business in South Florida? I speak from a newbie’s perspective, having recently moved from San Francisco. The positives are many. The first that comes to mind is the strength of the medical infrastructure down here, whether it’s hospitals or ambulatory clinics. There’s an enormous presence, which allows us to recruit talent with a health care background. But the difficulties: Traffic. The people you can recruit, sometimes they don’t want to be driving an hour, an hour and a half each way to work. So being based here is good from a recruiting standpoint, but for people to actually come, there’s the challenge. What’s the secret to a successful business? Perseverance. Especially if you’re a young company, one that is in a burgeoning industry, with Silicon Valley roots …. Building a company against established players — you’ve got to persevere. When you get knocked down, you’ve got to get up. What’s your most treasured possession? My photo albums of my youth and my daughter’s youth. I’m an avid photographer, and I enjoy being able to look back and reminisce. How do you shake off stress? That assumes I do shake off stress! But I do love to run. The South Florida heat makes it tough; I run farther and faster in San Francisco. Finding mental breaks – whether it’s a book or quiet time or even just a flight – also helps. When I’m on a plane, I try to split my time. I fly back to California a lot, so I spend a couple of hours working and a couple of hours reading or watching a movie. Which of your daily habits do you think is the most telling of your true nature?My morning ritual: a cup of coffee and the app Headspace. It’s a guided-meditation app where you spend the time to think through your previous day and the day ahead, and the things you’re grateful for. It’s just good to spend a few minutes in that frame of mind. Where am I most likely to find you on a Saturday night? Either at the movies or out to dinner. The food scene here in South Florida is fantastic. Trying new restaurants is a biggie. What is your motto? Attitude is as important as ability. Debora Lima covers technology, startups, biotech and transportation. Get the latest tech news with our free daily newsletter. Click here to subscribe.